This should give you a good idea of what this guy's work is like. “”Over 240 years ago George Washington suffered through Valley Forge and crossed the Delaware River to bring an astonishing victory to the Continental Army. [...] Today, Trump endeavors to cross the “swamp” of Washington DC as he carries the light of truth, hope, and prosperity. The murky water of the deep state is laced with dangerous vermin, perfectly willing to destroy American prosperity for their personal ideologies and financial gain. The establishment Democrats, Never-Trumper-Republicans, Deep State, and Fake News Media will do all they can to stop the majority of the American people from succeeding. —Product description for "Crossing the Swamp"
Jon McNaughton is an artist living in Utah. Having received a BFA from Brigham Young University, he has been painting for 25 years. Since 2009, he has churned out absurd paintings depicting the Founding Fathers as devout Christians, several paintings highly critical of Barack Obama, and several paintings about his newest theme, glorifying President Trump. Through his website, he sells original paintings, giclée prints (frame optional), and t-shirts. The real tragedy here is that McNaughton is actually a fairly talented artist. It's just that he also happens to be a crazy person. 4.2 Hail to the real president! —A slightly different take on McNaughton's One Nation Under God. Mr. McNaughton's website helpfully explains every last scrap of symbolism in his artwork, leaving nothing to chance, or interpretation. His most famous is perhaps One Nation Under God, depicting Jesus surrounded by a range of patriotic figures and liberal bogeymen, along with some figures representing real Americans. 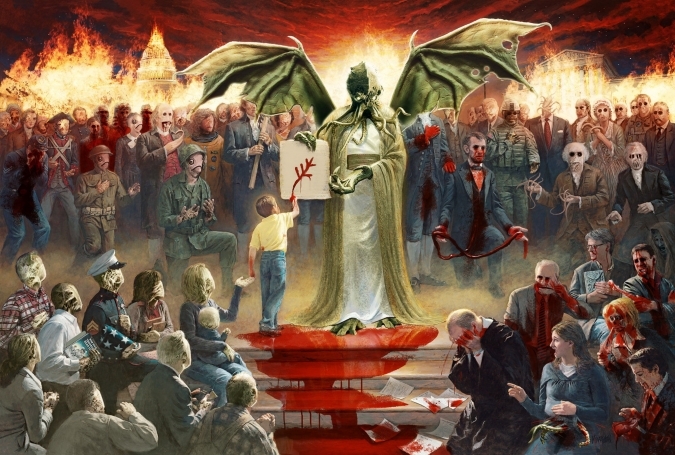 This spawned its own parody, entitled One Nation Under Cthulu, which does exactly as it says on the tin and a rewording of McNaughton's "interpretation", which takes a far sharper tone against the conservative sentiment of the original. Mr. McNaughton's "Patriotic" art is of a "libertarian" bent. His paintings, The Forgotten Man and The Empowered Man, associate Barack Obama with a number of American presidents McNaughton believes hurt the US through out-of-control spending and stifling regulation. Opposing this group of scoundrels are the heroes McNaughton imagines to be true patriot Christians. Oddly, this latter group includes Thomas Jefferson, who was so devout, he removed the miracles from the gospels. The most blatantly partisan painting is One Nation Under Socialism, a depiction of President Obama burning the Constitution. Also noteworthy (in hindsight) is the imagery of McNaughton’s is Obama’s Foreign Policy which features a golf playing POTUS against a backdrop of “fire & fury” — hmmm..., now who does that remind you of...? Aside from glorified political cartoons, Mr. McNaughton produces pleasant landscapes and "uplifting" religious art. It is possible he uses his more controversial paintings for publicity. After inviting Mr. McNaughton onto his show to discuss One Nation Under Socialism, Sean Hannity decided to buy the original painting for six figures. McNaughton's One Nation Under God was removed from the bookstore at his alma mater, Brigham Young University. McNaughton assumed something was wrong with the people he made uncomfortable, rather than admit his artwork was seriously over the top. Jon McNaughton maintains a blog, where he proudly talks about his art. His paintings are about as subtle as a sledgehammer to the knee, but McNaughton feels the need to explain his politics anyway. He supports Ron Paul, wanting to return to the good old days. In the election, he voted for Mitt Romney, for reasons he does not care to discuss. He knows what a True Christian is. His work is not satire. He definitely doesn't live in reality; believing that Obama was sort-of responsible for an embassy attack and ran a "deceitful campaign". Hail to the real president! "Angel of Liberty—The Vision of George Washington"
↑ One Nation Under God, the Video!. ↑ McNaugton Fine Art's Patriotic Gallery. See for yourself. ↑ McNaughton Gift Shop, Nothing more American that that. ↑ One Nation Under God. Yes, he thinks the US Constitution was "inspired by God". ↑ The Forgotten Man. It's a Miracle! FDR can walk!. ↑ One Nation Under Socialism. So much for subtlety. ↑ Sean Hannity Breaks the Bank for Insane Anti-Obama Painting, It seems money can't buy good taste. ↑ Blog entry 4.12.2012, From McNaughton's blog. ↑ Blog Entry 4.08.2012, McNaughton's Blog. ↑ Blog entry 5.15.2012, McNaughton's blog. ↑ Blog entry 11.11.2012, McNaughton's blog. This page was last modified on 4 April 2019, at 20:54.